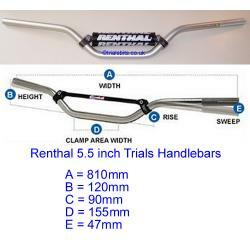 Renthals Trials Handlebars 5.5 inch rise in a silver finish. Supplied with a black Renthal Bar Pad pre-fitted. For more information on the dimensions, please click on the image to enlarge.